Roses are red, violets are blue, smoothies are great and so is this too! That’s just my made-up line but since it perfectly rhymes then I would say I am definitely in the mood for Valentines Day! Whoop! I am flashing back to my secondary school days when we would be so excited and pumped up for Valentine’s Day even though we were stuck in boarding school and far from our crushes and high school sweethearts. Valentine’s Day in secondary school was the most-looked-forward-to event as It entailed expecting the post master to deliver valentine’s day cards and gifts wrapped in shiny red gift wrapping paper or sometimes even bouquets of faux roses. We loved it all! Shrieks of excitement could be heard for miles as lucky girls received their parcels and the not-so-lucky girls would quietly spend the night reading in the library. Fun times! Beautiful memories. Another valentine’s day is just around the corner and it seems also to be a perfect time to show love to your body by making this incredibly healthy raw beet smoothie. It’s also a fantastic recipe to make to share with your partner in case you have an eating-in lunch or stay-at-home dinner plan. The energising and vibrant colour of this smoothie is 100% guaranteed to bring out a smile and a delightful laugh from your date partner. Beetroot became one of my favourite root vegetables about three years ago. I never knew I was missing out on such deliciousness and fantastic health benefits! I did a bit of digging around on the www and discovered it’s amazing antioxidant and anti-inflammatory properties in fighting cancer, lowering your risk of heart diseases, improving eye health amongst other incredible benefits. Others have also hailed it as having aphrodisiac properties due to the high nitrates content. Beetroot is quite common in most supermarkets and local markets and GHC5 is enough to get you 3 fleshy beets. I added other local fruits and ingredients to make this smoothie a definite winner: soursop, kiwi, a squeeze of lemon juice, a green apple and freshly brewed hibiscus tea (sobolo). Soursop ranks high also as one of the super fruits we have available in Ghana and since it’s in season what better time to use them before they disappear. The health benefits of soursop ( locally called Aluguitugui) are incredulous! Even some Ghanaian doctors prescribe it for their patients low on immunity to boost their immunity levels. First, start with washing the Hibiscus leaves and steeping them a ceramic bowl filled with hot kettle boiled water for ten minutes. This ensures your smoothie isn’t too tart as compared to boiling it on the stove. Tart can be for another day. A handful of dry hibiscus leaves is fine. 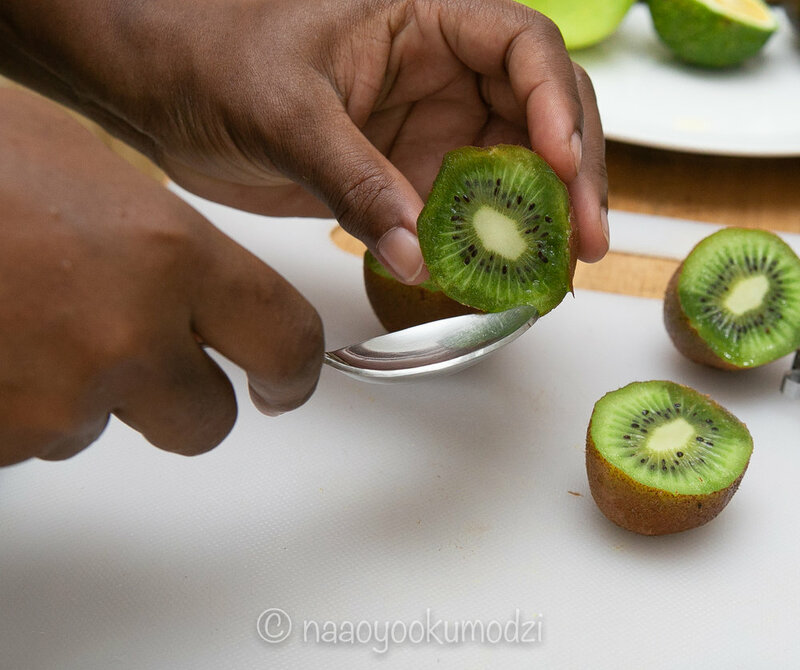 Spoon out the kiwi gently. Slice or dice your apple and chuck ‘em into your food processor. 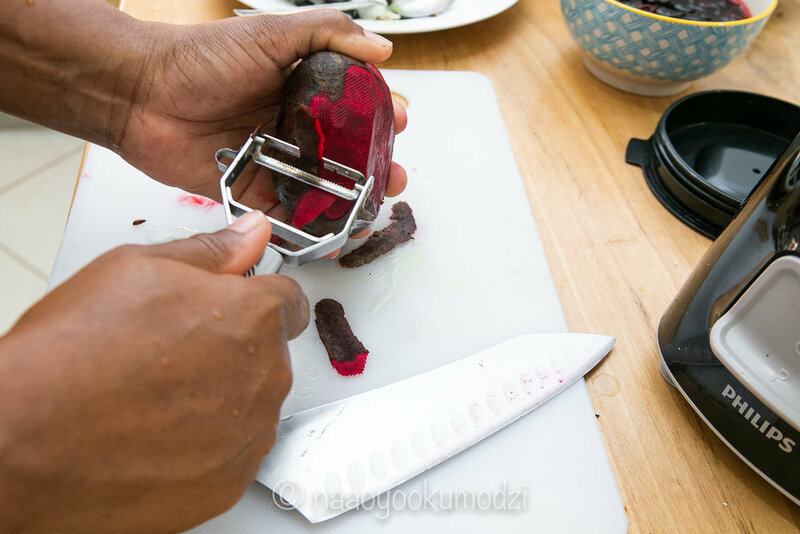 Using a vegetable peeler, peel the brown aged looking skin off the beets and dice into big chunks. Add that into the blender as well. Weirdly I don’t have a photo of me spooning out the sour sop but yeah, it goes in as well. Just make sure to remove the hard seeds before blending. Those seeds are major hard! The Hibiscus tea is ready by now. Strain the leaves from the liquid using a mesh strainer to get this beautiful rich liquid which goes right into the food processor. Just look at those colours! Squeeze in the half lemon using a lemon squeezer. Blitz for two minutes until perfectly smooth. Chill in refrigerator until ready to serve. Oh and add a dollop of probiotic yoghurt not just for the extra healthy boost but also it makes the smoothie pop in color! This smoothie just checks all the marks on heart-healthy, incredibly flavourful and refreshing, easy to make and gorgeous to look at or photograph for the gramm.